If you look around the world, you’ve got slow growth. We have virtually every country trying to devalue against the dollar. Commodity prices are declining because of too much supply. And all this does feed into a considerable threat of deflation which scares the daylights out of central banks. The majority of people somehow are looking for steady patterns and simplistic answers. They’re looking for something that fits into what used to be the regular cycles, but this is just not anything like that. Yellen blames falling prices of oil and imports, which should end once oil and import prices stop falling, but offers no evidence that they will. Will the Fed Raise rates again ? Yellen is laying the groundwork for no further rate increases this year and beyond unless labor markets tighten and inflation spurts. 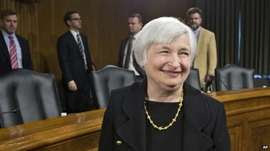 She’s probably even preparing the markets for a rate cut. When you're in a price war—and that's what it is—you have to ask where is that chicken out price (before you see massive production cuts)? And this is the reason that over a year ago I said we could get to $10 to $20 a barrel. The chicken out price is not the cost of meeting budgets. For the Saudis that's $95 a barrel; Kuwait it's $45; Venezuela it's $160—it's all over the map but it's way above current prices—no, that's not the point. The price at which players chicken out isn't what they call the full cycle price—it isn't the cost of drilling a new oil well, putting in all the infrastructure, the pipes, the drilling costs and so on—no, no, no. When you're in a price war, it's the marginal cost; it's the cost of just getting the oil out of the ground when the well is drilled and the pipes are already laid. It's like a gas war with four gasoline stations on an intersection, one of them starts to cut prices and the other follow because they don't want to lose market share and they keep going. Well, where do they stop? They don't stop at the full cost of running that gas station. They stop at the point when the price of gasoline they are selling you and me is at the cost they pay to get it out the tank truck plus taxes—that's it! That's the marginal cost and that's where you end up. And the marginal cost—and this is the basis of my forecast over a year ago—the marginal cost in the best producing areas like the Permian Basin and in the Middle East is $10 to $20 a barrel and we've seen tremendous productivity growth—it's probably even getting lower!" The current turmoil on China’s stock exchanges and in its economy are shaking markets globally. It’s not surprising. After more than two decades of rapid growth China’s GDP represents nearly 60% of U.S. GDP, and it is the world’s second-largest economy. The Chinese have reveled in the widespread conviction that, with recent sluggish growth in North America and Europe, China was inheriting the mantle of global economic leadership. Indeed, many observers were counting on that growth spilling over to the West. But suddenly China’s economic leadership seems to be shifting into reverse. Like virtually all developing economies, China depends on exports. But with slow-growing Western economies the rate of annual export growth in China has gone from 20% to 30% in the 2000's to a recent decline of 7% last November. Also, globalization–the transfer of manufacturing and other production from the West to China and other emerging economies–is largely completed. The weakness in China has been masked by its massive housing and infrastructure investments. But even these are dubious. Witness China’s ghost cities, rampant excess capacity and the fact that total corporate, government and household debt has leaped from 121% of GDP in 2000 to 282% in 2014. Another telltale sign of trouble? GDP per capita in 2014 was just $7,590, or merely 14% of America’s. China’s leaders want to shift to a domestic-led economy, driven by consumer spending and services, but whenever overall growth lags they resort to the same old infrastructure spending. The result is even more excess capacity and more power for the inefficient state-owned enterprises, which are never allowed to fail. Meanwhile, private firms are starved for capital. These actions reveal Beijing’s distrust of free markets. Consumer spending in China is just 36% of GDP. In India it’s 59%, Italy, 61%, and in the U.S., 69%. China is a giant in global manufacturing but is amateurish financially. Last summer the government clumsily intervened to arrest the one-third drop in Chinese stocks after hyping equities as the way to recapitalize debt-laden SOEs. Short-selling was prohibited and brokers and state-owned enterprises ordered to buy stocks. As scared investors traded yuan for dollars to ship overseas, foreign currency reserves fell by $300 billion. Then, in an attempt to spur exports and revive economic growth (which is probably half China’s stated 6.9% rate), there was a currency devaluation. Chinese officials seem to want more of a free market but insist on top-down control. It doesn’t work. Recently instituted circuit breakers to protect investors from massive selloffs, for example, backfired after the limit was hit twice in the first week and skittish retail investors dumped stocks. Similarly, official attempts to weaken the yuan to spur exports resulted in a stampede out of the Chinese currency and forced the central bank to reverse gears. China won’t shrivel up and die, but as it shifts from commodity-munching exports, housing and infrastructure to consumer spending and services, China’s global importance will shrink. This happened to Japan starting in the early 1990's. Before that, many Americans thought they’d soon be working for Japanese companies or be run out of business by them. But in 1990 Japan’s stock market bubble collapsed, as did overblown house prices, and the economy fell into an ongoing era of 1% real GDP growth and deflation. Similarly, Chinese stocks went off the cliff last summer, and residential housing activity has nose-dived. Just as Japan put off cleaning up its “zombie” banks, China will delay restructuring its bloated SOEs. You may also remember Japan’s buying spree aimed at trophy properties and at securing raw materials for its manufacturing juggernaut and markets for its output. History shows that Japan lacked growth-spurring investment opportunities at home. Think Midwest farmland, Pebble Beach and Rockefeller Center. Have you noticed that China has been on a foreign buying spree? Lastly, there are also demographic similarities. Both countries have declining workforces.... But unlike Japan, China will get old before it gets rich.